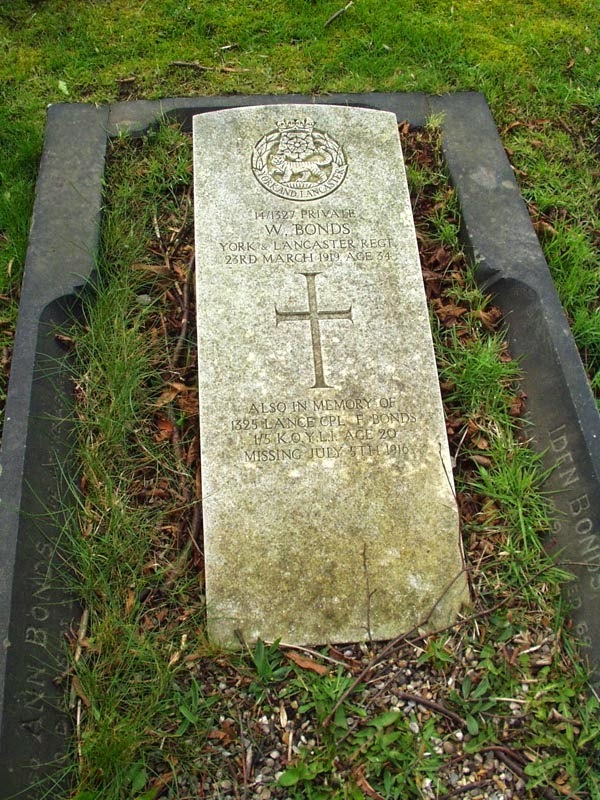 York and Lancaster / 14/1327 Private / W. Bonds / York & Lancaster Regt / 23 March 1919 age 34 / also in memory of / 1325 Lance Cpl. F. Bonds / 1/5 K.O.Y.L.I. Age 20 / missing July 5th 1916 / Iden Bonds / who died July 14th 1919 aged 69 years / also Ann Bonds wife of the aforesaid / who died Sept 29th 1935 aged 79 years / At rest. They were cousins to Richard Ward Wealthall whose story is remembered here.